A major in aeronautical engineering technology will prepare you to design, manufacture, maintain, operate and support all varieties of aerospace vehicles. With these skills, aeronautical engineering technology graduates can become leaders in a variety of fields: aerospace and spacecraft manufacturing, airlines repair engineering, aerospace leadership development programs, and corporate flight operations management. This program can be completed in three years; ask an academic advisor how. The aeronautical engineering technology program is accredited by the Engineering Technology Accreditation Commission of ABET,www.abet.org. The bachelor's degree in aeronautical engineering technology is accredited by Aviation Accreditation Board International (AABI). When people talk about sustainability, jet fuel doesn’t come up in the conversation. Unless it is Gozdem Kilaz who is talking. 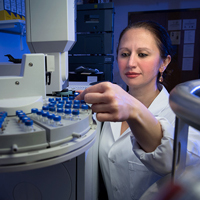 Kilaz, an assistant professor of engineering technology at the Purdue Polytechnic Institute, her alma mater, is head of the Fuel Laboratory of Renewable Energy. She and her group research sustainable energy and alternative liquid transportation fuels for gas turbine aircraft engines. “We want to look at the chemical composition of a drop of fuel, just like a fingerprint, and work on predicting if the fuel is going to be stored well, if it is susceptible to corroding or not, if it is going to be safe with all the parts it comes in contact with in the aircraft,” she said. Kilaz believes there is more to her research efforts than a desire for knowledge or an eagerness to educate future generations. But understanding what factors into a fuel’s performance could offer avenues in determining lower development costs of alternatives and dependence on crude oil sourced from other countries.